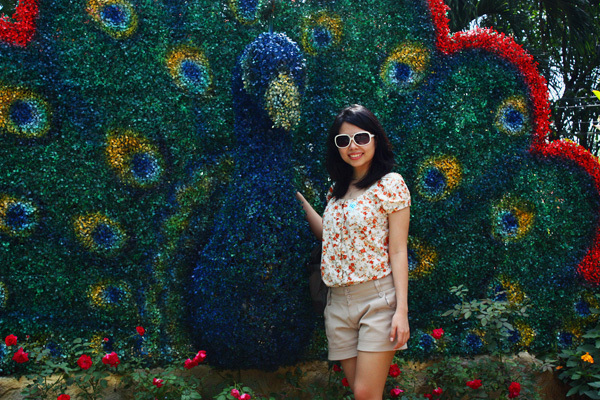 For our first sight-seeing day, we ventured out of Bangkok, rented a taxi, and made our way to Pattaya. 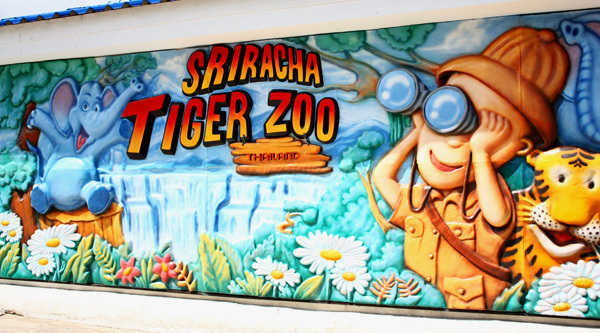 On the recommendation of the hotel concierge, we went to the Sriracha Tiger Zoo. 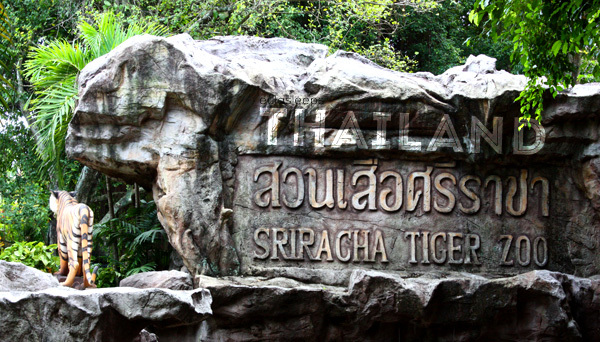 It boasts a population of more than 400 tigers, along with crocodiles, pigs, and elephants. 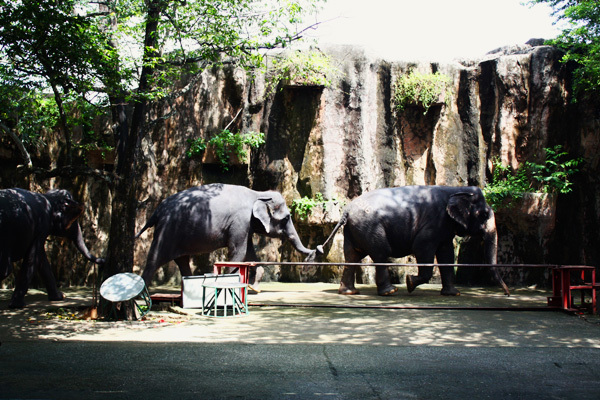 We were surprised to find that it is more of a circus than a zoo, with several animal shows scheduled daily, and very few informative posters. and jumping through rings of fire. 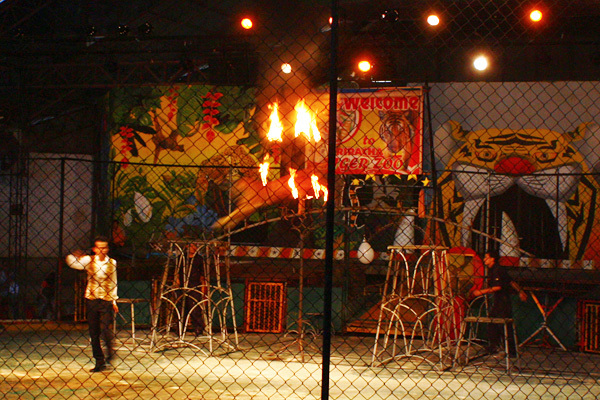 There were many more tricks like tigers rolling over, tigers jumping over 5 other tigers Evel Knievel-style, tigers dancing with trainers, tigers walking right ropes. It was quite a sight. There was also this one tiger who kept spraying the crowd with his scent. (You could literally see the arc of the spray.) Made me glad we sat in the back. 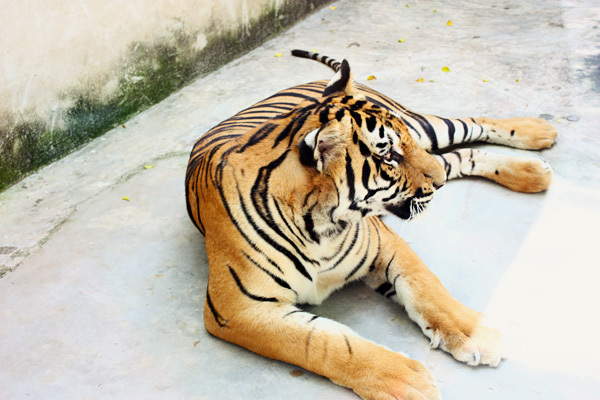 Their practice of keeping the tigers docile is questionable. Tigers who weren't following directions were struck with a baton, but I don't know how much force was used. It's also disturbing/amazing how close the trainers get to these tigers. They're near enough to hug! 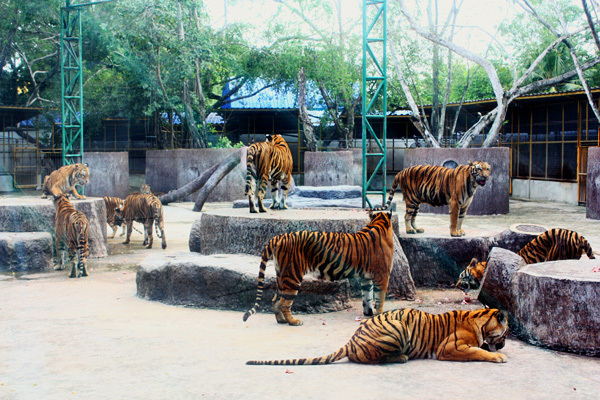 I've read that the "zoo" is actually a breeding park for the tigers, which explains why there are so many of them. 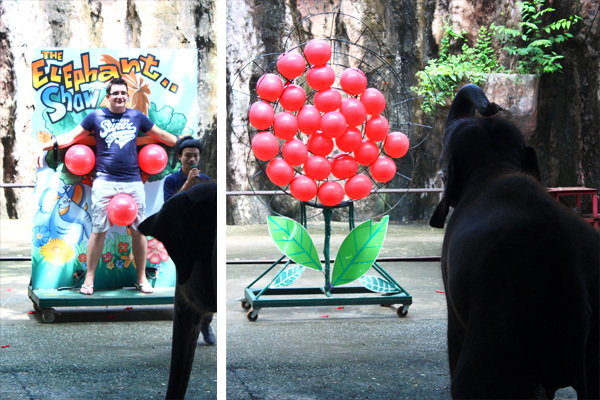 After the Tiger Show, we headed over to the Elephant Show. We arrived 10 minutes early, but already there were very few seats left! So we had to sit apart from each other. But we still enjoyed. They ended with a dance and a bow. 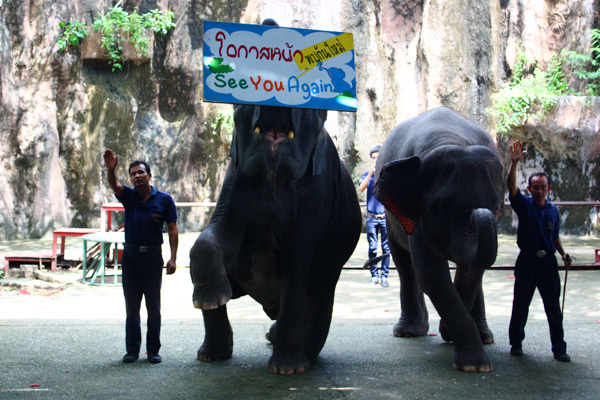 After the show the elephants, the elephants stood in front of the audience for photo-taking purposes. 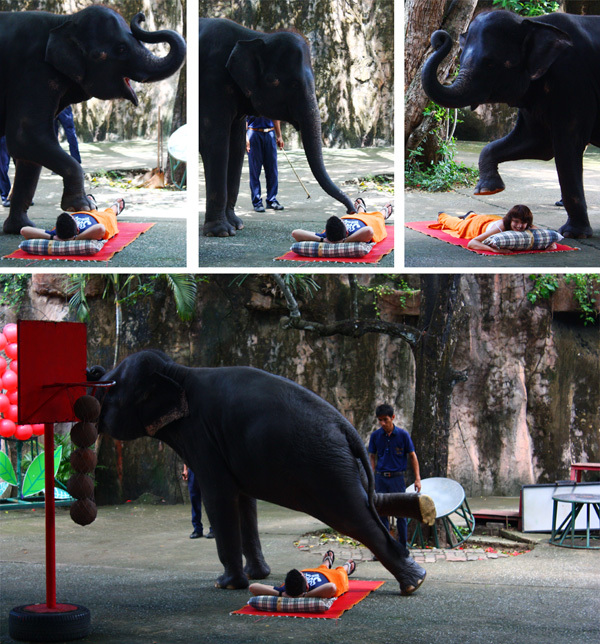 After each photo, the elephant use their trunks to take money from people and pass it to the trainers riding on their backs. so we had a little snack! 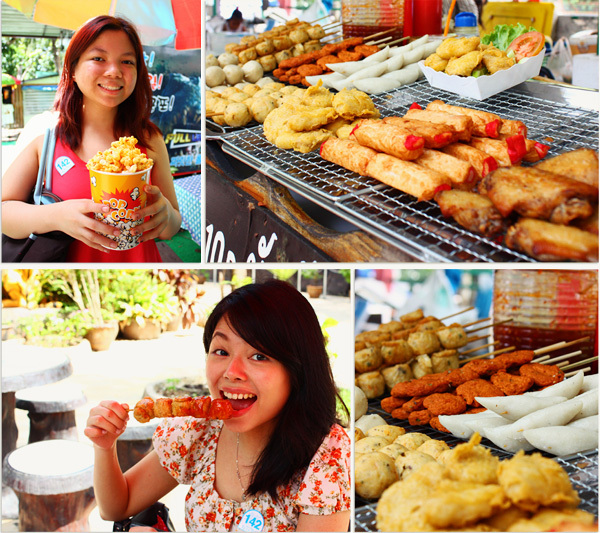 Caramel popcorn and meats on sticks. Yum! 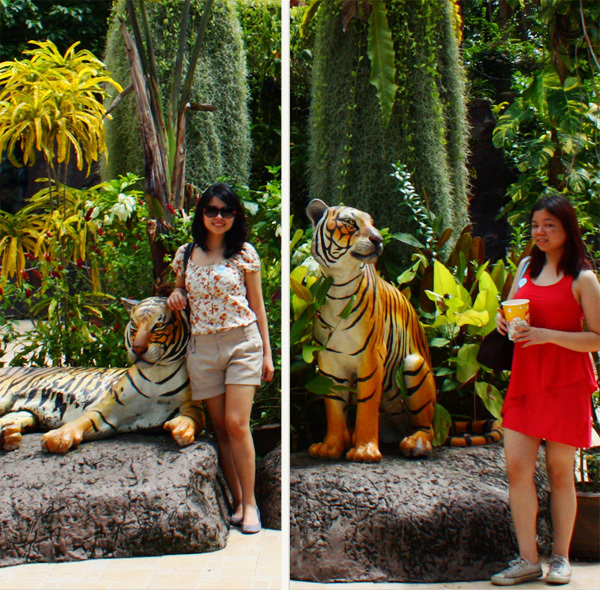 We weren't in the mood to see the pig race, Crocodile Show, or other attractions, so we just walked around looking at tigers. 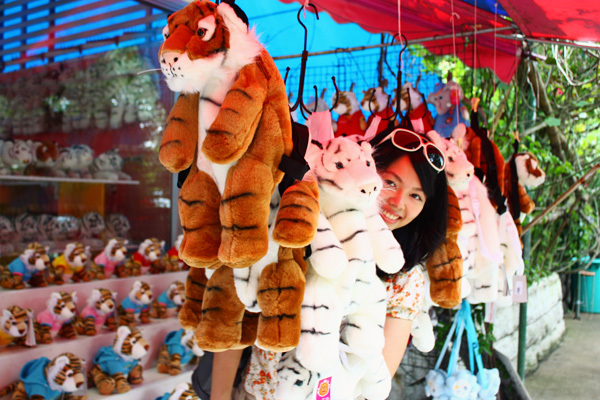 I've never seen so many tigers in one enclosure! Slightly creepy, because in the wild these guys are solitary. 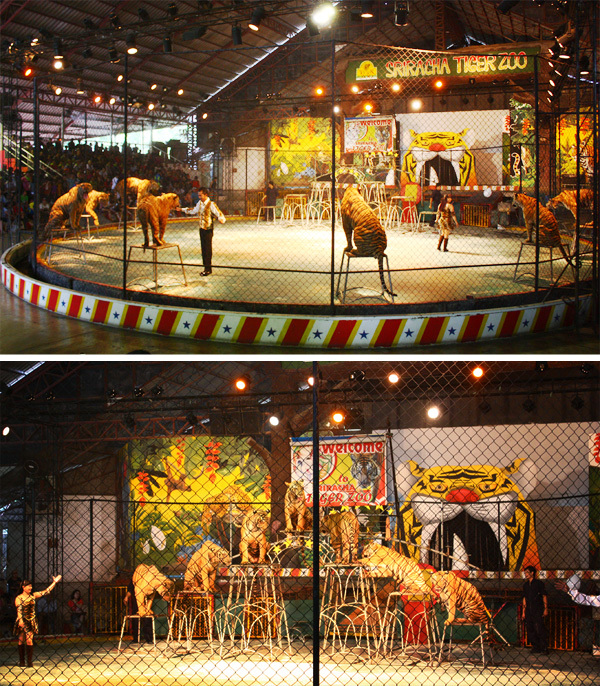 This was a booth-type attraction where you would shoot at a target above the tigers, and if you hit it, raw meat would drop down for the animals to eat. 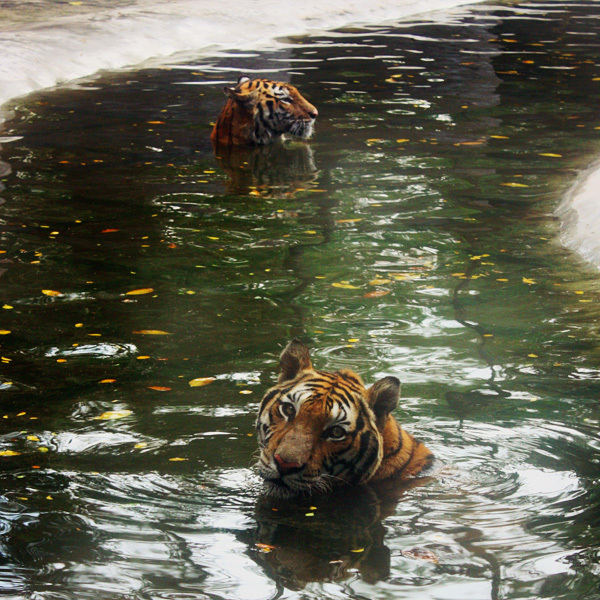 It was so hot, even the tigers couldn't resist taking a dip. 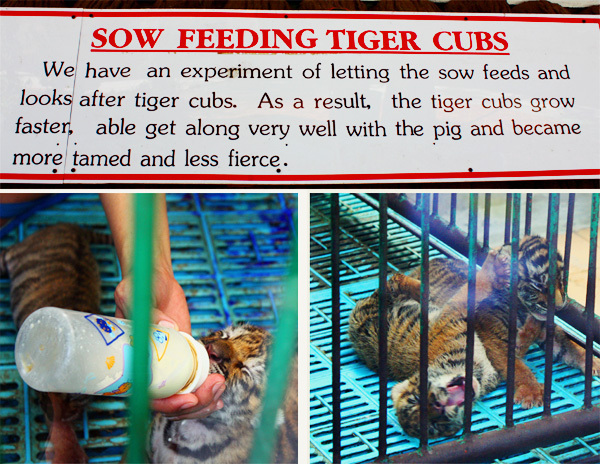 Baby tigers are fed pig's milk because it supposedly gives them a tame personality. We brought home one of these really soft tiger backpacks. There were also a few of these oddly conceptualized dioramas of anthropomorphized (baby?) 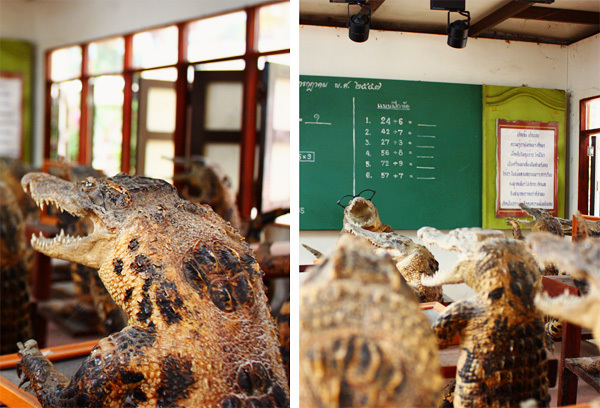 crocodiles. I don't know what a peacock was doing there. 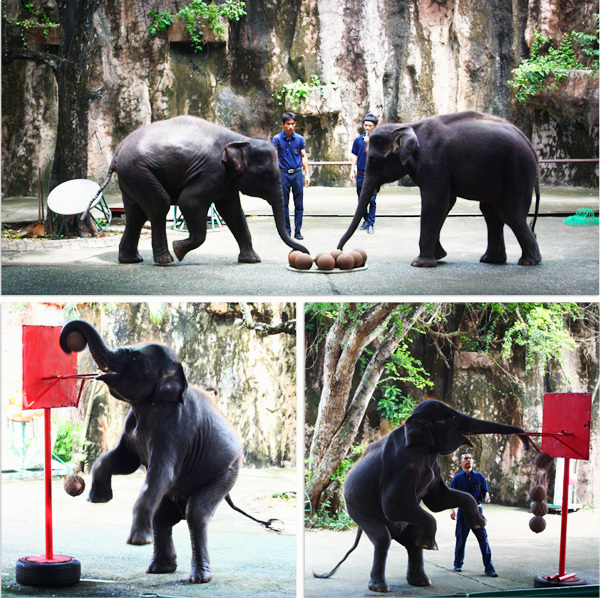 You could also take photos with tigers (for a fee), feed baby tigers (for a fee), and ride an elephant (for a fee). 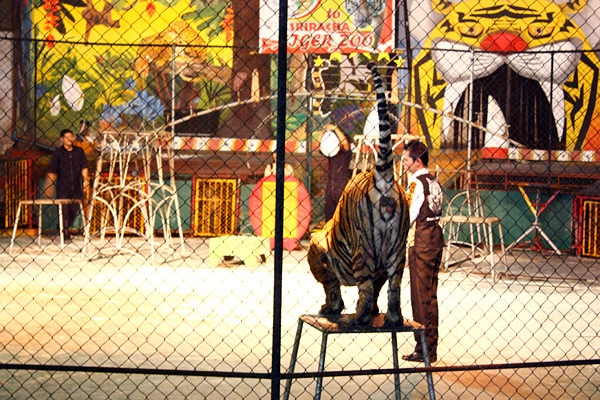 My wonder and surprise at the watching the animal shows was mixed with an uneasy suspicion that the means for conducting such spectacles wasn't entirely just. 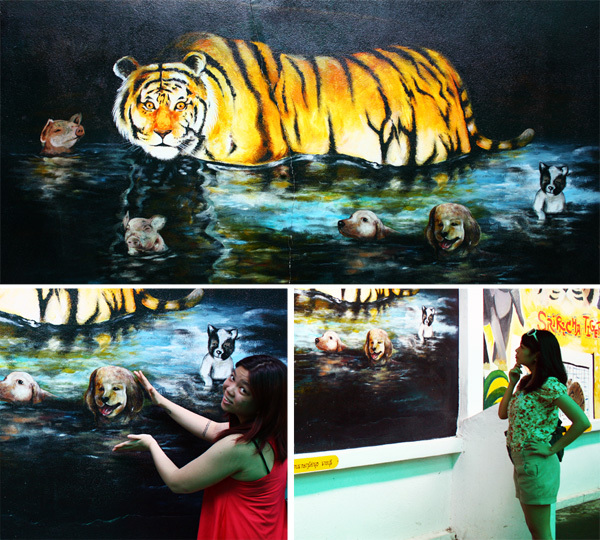 It is after all, it is an unnatural environment for wild animals. 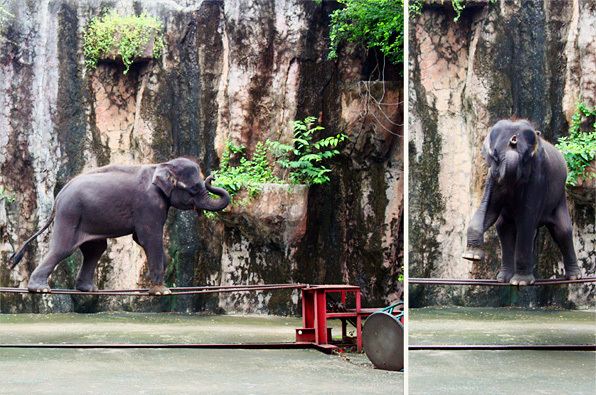 Kids will definitely love the animal shows and the chance to touch tigers and elephants. 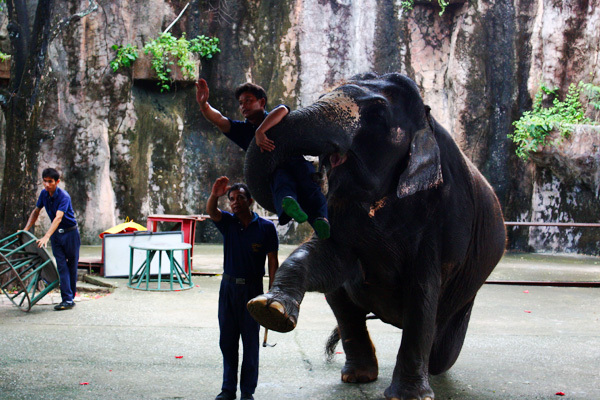 Individuals who have a soft spot for animals may find it difficult to look beyond the fact that these creatures are being used for profit, in the guise of wildlife conservation. A half-day visit should suffice.